Continuing our column swap up this month, I’ll be taking over for Jason in this edition of Indie-ana Co-Op. Gosh, I remember when tower defense (TD) games were kind of a fringe thing, confined to mods for games like Warcraft III. Times have changed, and now wherever you look there’s a new TD game popping up. And hey, it’s kind of a great thing because I’m fond of them. 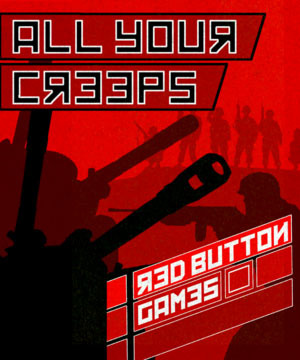 All Your Creeps is a pretty straight-forward TD game at first glance, but instead of going for the strategy build (e.g. let’s think about how we want to maze our towers and carefully figure out which towers we need to build), it goes for a frantic action build. Players can either be the Comrades or Swine side. The Comrades are defending the rocket in their base while the Swine are trying to take down that rocket. 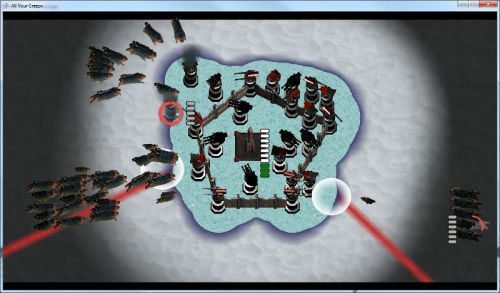 The computer will take over whichever side the players do not choose. There are two modes to pick from: Normal and Endless. Normal has players defending/attempting to destroy the rocket for 5 minutes. Whoever has succeeded after those 5 minutes is the winner. Endless does not put a time limit on the game, so you can just keep going and going. So what about that “frantic action” I was talking about? Unlike many other TD games, there is absolutely no build phase in the game. After being dropped into a game, defenders get a few seconds to plunk down whatever defenses they can, and the attackers are unleashed. From that point, it’s constant action until someone is declared the winner. Not only is the speed relentless, but to be super effective, players will have to think on the fly as the different attacking units and defending towers have different strengths and weaknesses. For example, a Wall is strong against Grunts but weak against Spies. Grunts are strong against Rocket defenses, but weak against Walls, and so on. It’s like a giant game of rock, paper, scissors. Though I probably wouldn’t find myself playing All Your Creeps for hours and hours at a time, it’s a pretty fun game to jump into with a friend for a quick 5-minute game or two. The action feel to the TD genre is refreshing, and it’s a pretty solid experience for a mere $1. The Co-Op Experience: Play either Normal (5-minute) or Endless (no time limit) mode with up to 4 local players, either defending or attacking the objective. All Your Creep is For: TD fans who like a little action in their TD games. Also, players who like the idea of TD games, but want to be able to play extremely quick games. Page created in 0.5951 seconds.